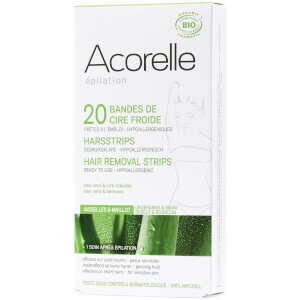 Guarantee ultra-soft skin for up to four weeks with the Acorelle Ready to Use Aloe Vera and Beeswax Face Strips; a pack of 20 ready-to-use strips that remove unwanted hair quickly and effectively. The face strips are the optimal size for small areas of the face, including eyebrows and the upper lip. Enriched with a hydrating and soothing blend of Organic Beeswax and Aloe Vera, the hypoallergenic waxing strips are suitable for all skin types, including those with sensitive and intolerant skin. The non-irritating strips respect the visage whilst removing all hair lengths and thicknesses, including the shortest of hairs. Rub strip vigorously between palms. Gently pull apart to reveal 2 waxed strips. Apply strips to the skin, pressing down firmly in the same direction as hair growth. Remove strip quickly by pulling strip edge in a direction opposing hair growth. A strip can be used several times, for as long as it sticks to the skin. Apply the organic sweet almond post hair removal care, to remove wax residues. Tip: Prepare skin the day before waxing by scrubbing and using the Acorelle anti-ingrown hair solution. For best results wax cool dry skin.